Truly great? Or truly grey? | kensfolk. Truly great? Or truly grey? What makes something truly great? The most people liking it? A high return on investment? A satisfied feeling after partaking in it? And who, may I ask, is it that decides what this “great” thing is? The media? The people? The stars? I just truly believe that so much of what is considered “great” just… isn’t… at all. The music, the movies, the conversations of today. It just bores me, honestly. But yet, America has confidently decided that “Pitbull” is who deserves the crown of musical talent. -_- Classy. Here are a few other things that I found to be less than they were hyped up to be. Not in a way that was offensive to me, such as top 10 music choices, but merely something that didn’t live up to it’s claim to fame. 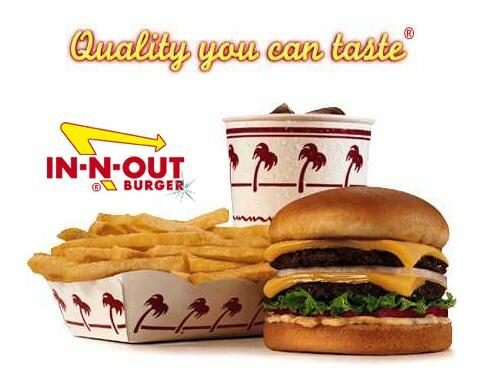 I have heard, for years, about In- and-Out burger, and their “food from the heavens”. Friends coming back from California burning for more of this feast fit for a king, proudly sporting their In-and-Out logo’ed T and bumper stickers. This burger joint has become a main tourist attraction for people all across America, coming to get their piece of California’s malted chocolate serum of life. An In-and-Out burger was just recently built in Allen, Texas. There hasn’t been a day since they started construction that somebody doesn’t excitedly announce to me that they heard one was being built in Texas. Well, while in Allen last weekend, I decided to take part of this legend. With a 35 minute line that spilled out into the main traffic, as well as being directed by police officers, I couldn’t imagine what I was about to get my hands on. And waiting to get there was the least of the problems. Then it was a standing line to get inside of the door, and then after being ushered in 2 or 3 people at a time, like a six flags ride, you made it to another line to order. Then given a number, up to 100, to wait in line for your food.. and don’t even expect a table to eat at, that’s silly. Once we finally get our food, I take a bite annnnddddd… it was burger. Maybe the fries will be legendary.. let me have a bite of that! Chew.. chew.. eh, it’s alright. Don’t get me wrong, it’s a good burger, but REALLY? This is what people have been lusting over for generations in that surfer state? Granted, I’m not a red meat kinda girl, and I don’t regret eating it, but for all the hype, I was pretty let down. It reminded me of when Krispy Kreme came, and my dad talked to me about how men would kill for these puffs of sugary splendor, and waited in the longest line I had ever seen in my young life for a box of them. And now they sit in boxes, hard and untouched on the shelves of 7-elevens. I have yet to see him eat a donut since. 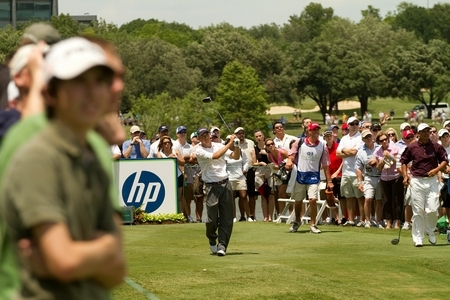 Last weekend, I went to the Byron Nelson PGA tournament sponsored by HP. I have heard about this specific event several times throughout the years, and, boys particularly, get fired up about this once in a year opportunity to see their favorite golfers play. I guess I just don’t understand what all the hype is about golf. Maybe even playing it.. fine.. but thousands of people were there just to watch. I really couldn’t believe how many people were there spending, on the very lowest end, $45 bucks a pop along with another chunk of change for parking PER DAY for this four-day tournament. The longer I was there, surrounded by Ralph Lauren-ed out fratstars, kids in burberry, dolled up girls in dresses and Prada, older men with PGA visors (bought there for triple the price), farmers tans, and significantly younger wives, I decided that golf must be a rich man’s excuse to get drunk and feel okay about it. Seriously, how are you even supposed to survive watching a ball go into a little tiny hole under the scorching summer sun for 10 hours a day without buying hordes of 10 dollar beers? At noon, most people are already intoxicated, while I trekked across the whole location for a sip of free water and use a portapotty (only VIP members who pay $200 a day get a porcelain bowl.. duhh.) I was happy that I experienced my first major golf tournament, but I feel like my Mavs games are a much better investment of my time. 3. The beatles on I-tunes. Listen. 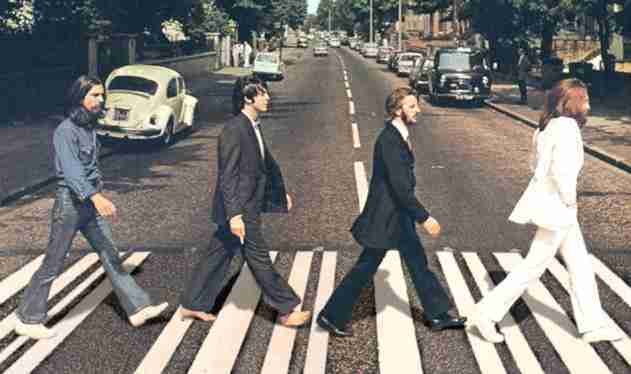 I love the beatles. I have a poster of them in my room, but the Beatles finally available on iTunes – Biggest non-story of the year. Everyone is acting as if this was the first time you’ve been able to hear about their yellow submarine since they died. If you are any kind of serious fan (one that would merit this Itunes change to alter your life) you would have gone to Target and bought it yourself sometime in the.. ehh.. half century. Here’s a modest proposal: nobody talk about The Beatles for the next ten years. Starting in 2021, we can talk about them non-stop for 47 years straight… again. No. I don’t want to hear about your vampire boyfriend who you can’t even touch because he’s cold, or he’ll eat you. The end. Now, to be fair, I asked around to different sources to see if anyone had a strong counter argument for any of the above. I took a look into why people consider some of these things “great” and listened to their rebuddle of my opinion. 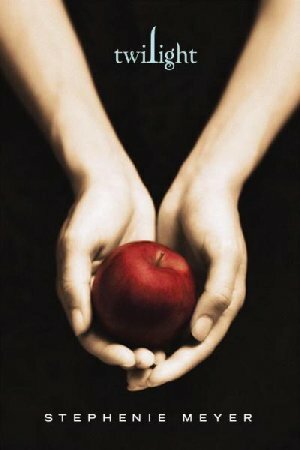 Other than discarding any argument about the greatness of Twilight, I took all sides into consideration. One of the arguments, in the defense of the Byron Nelson came from a golf fan who simply enjoyed the sport (you can’t safely argue an avid fan of anything too seriously). After reading my post about my PGA experience, he told me that he agreed with a lot of what I said, but that it takes someone who has played golf to truly appreciate the art of what they are seeing. He said it wasn’t until after he hit for the first time that he realized what a feat it is to hit something so small, for so far, with such accuracy, anywhere near the hole. Another golf fan continued to enlighten me: “There are so many factors”, he stated, “to overcome when you are working with variables that small. The wind blows just a few miles faster than the day before, and it might cost you a championship if you don’t hit accordingly. When you see someone engineer the perfect hit, it’s something amazing to watch.” Okay, so my golfing resume has little more on it than being able to hit the bright-colored golf ball into the hole in the hippo’s mouth at putt putt in 2 tries, (yes, I am proud of that) so I’ll cut the Nelson some slack for not entertaining me to the extent that I expected. But as I witnessed, the golf fan did admit that golf tournaments are for rich men. and lots of alcohol. So I figure I could meet a middle ground and say that it must be like the difference of wine tasting to going to a bar. The bar go-ers could argue that wine tasters are just being uppity and cultural, while defending their bar attendance as more acceptable and social, and more “down to earth” since you’re paying for 3 dollar long necks with the rest of the middle class trying to catch the game after work. But for those people who truly appreciate wine, tasting a glass that is perfectly aged and produced is something to behold. I guess most things are truly in the grey. « 10am on a Thursday, sippin on some Clear American. I love your list! One note… all of the Beatles are not quite dead yet. I apologize, Ringo Starr and Paul McCartney, for considering you dead. in-n-out isn’t about the burger—it’s about the experience. it’s about the simplicity of it all, from the bright red and yellow logo with its dazzling arrow to its menu in uppercase helvetica to the way your burgers are angled towards your face when they are handed to you.